For years, Ruger’s product line was squarely focused on traditional firearms for the sporting market. 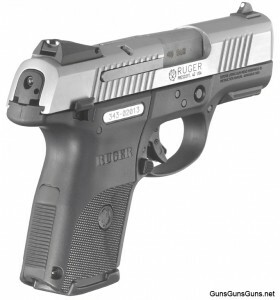 Of late, a slight change of course has occurred with Ruger developing a number of new firearms intended for law enforcement and self-defense, including the Ruger SR9, a striker-fired 9mm standout that embodies many features in demand by discriminating shooters. Predictably, Ruger chopped and channeled the service-size SR9 to create the compact SR9c, which is ideal for discreet carry by responsible citizens and off-duty police officers. 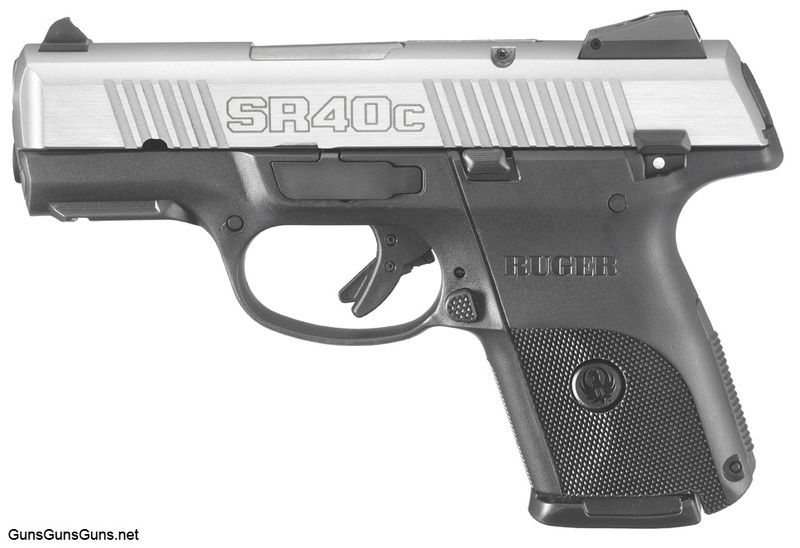 Then last summer, Ruger introduced the SR40, a full-size sibling to the SR9 chambered in .40 SW.
Would fate follow its established pattern with the SR40? Yes. 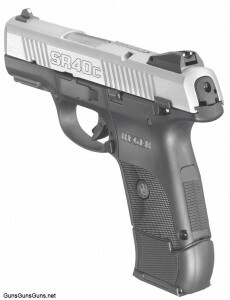 The SR40c is now a reality, and it appears Ruger has another winner on its hands. In December 2010, I attended a seminar sponsored by Ruger at the Gunsite Academy. At that time a couple of new products were introduced, including the Gunsite Scout Rifle, SR1911 and the SR40c. Suffice to say, the Scout Rifle and SR1911 captured the lion’s share of attention from the writers in attendance, and although I, too, was intrigued by these fine firearms, from a practical standpoint, I was more drawn to the SR40c. It appeared ideally suited for concealed carry 24/7, dressed in any type of clothing. Like the other SR9s and SR40s, the new SR40c is built on a black, glass-filled nylon frame. The pistols I fired sported stainless steel slides, but models with alloy steel slides with a Nitridex Pro Black finish will also be available. The careful eye will note fore and aft serrations for a positive grip and an external pivoting extractor on the SR40c’s slide. The SR40c measures 6.85″ long and 1.27″ wide. This clearly places the pistol well beyond pocket-pistol dimensions, but still not difficult to hide with the right holster. The slide is just a little beefier than the SR9c’s in order to tame the snappier .40 SW cartridge. Two magazines come with the gun, including one with a nine-round capacity that sits flush with the grip frame, and another holding 15 rounds complete with a grip adapter. With the nine-round magazine in place, total height measures 4.61″. The 3.5″ stainless steel barrel should push bullets fast enough for reliable expansion. The SR40c incorporates multiple safety systems. First, unlike many striker-fired pistols, the SR40c is equipped with a frame-mounted, ambidextrous safety. Sweeping the safety down takes the pistol off safe, making it immediately ready to fire. A number of passive safety systems are also built into the SR40c, including a striker safety, magazine safety and trigger safety. Additionally, this pistol offers a loaded chamber indicator, which is essentially a small flag on the top of the slide. When a round is chambered, condition can be ascertained visually, or by feel. The SR40c’s trigger is very user friendly and trips when 6–8 lbs of rearward pressure is applied. Users of a certain popular Austrian pistol will immediately note the similarity. In my experience, new shooters can get up to speed faster on pistols with this type of trigger action than with traditional double-action or double-action-only self-loaders. Sights consist of a two-dot rear, adjustable for windage and elevation, and a fixed dot front. The rear sight is angled and unlikely to snag on clothing, while the front is raked forward to facilitate a cleaner draw stroke. As an added bonus, the SR40c sports a molded-in accessory rail for lights or lasers, a feature not present on many compacts. The SR40c is also equipped with an ambidextrous magazine release. This lefty has always found it easy to use the trigger finger to drop the depleted magazine, but others will welcome this feature. Another desirable feature: the reversible backstrap. My sample pistol had the curved backstrap to the outside, but shooters with smaller hands would be better served with the flat side out to reduce grip circumference. That may not sound like much, but that feature often represents the line between success and failure for shooters with small hands. Initially, I found the thought of another compact .40 SW pistol pretty boring. What could this guy do that earlier pistols couldn’t? But after shooting the SR40c, I came to the conclusion it has a leg up on many of its competitors. While my associates went off to squeeze in more trigger time with the SR1911 and Gunsite Scout, I took the opportunity to shake down the SR40c. To get right to the point, this gun was totally reliable, accurate and a pleasure to shoot. I’ve often found the recoil sensation of many .40 SW pistols to be a bit snappy, but that wasn’t the case with the SR40c. The dual recoil spring and polymer frame help dissipate felt recoil, and I was able to run through a couple hundred rounds in short order with no fatigue whatsoever. Here’s the SR40c with the 15-round magazine. I didn’t perform formal accuracy testing, but I can report I was able to place just about all of my hits in the center of the Gunsite Option Target. Hammers at close range and more deliberate shots at longer distance yielded the same result. I admit the three-dot sight pattern isn’t the best choice for my middle-age eyes, but that didn’t seem to handicap my performance in any way. I also tried my hand on a few man-on-man drills, facing opponents armed with the SR1911 in .45 ACP. Surprisingly, I was able to hold my own and even managed to win a few contests. Equally gratifying results were achieved on a falling plate rack. Shooters in need of an ergonomically designed, good fitting pistol for discreet carry would do well to consider the Ruger SR40c. In my hands, this pistol proved reliable and comfortable while delivering more than enough accuracy for successful conflict resolution. At a MSRP of $525, this pistol is a best buy in the concealed carry sweepstakes. .40 SW 15+1, 9+1 3.5″ 6.85″ 4.61″ 1.27″ 24.2 oz. To read Dave Spaulding’s review of the full-size SR40, click here. To read Dave Spaulding’s review of the full-size SR9, click here. To read Dave Spaulding’s review of the compact SR9c, click here. This entry was posted in .40 SW, $251-$500, $501-$750, Compact, Ruger, Semiauto and tagged Handgun Reviews on June 29, 2011 by Mike Boyle. I was looking for something smaller than my CZ40b for CC but larger than my LCP. I knew when I saw the SR40c I was in love. Since I’ve been so happy with my LCP, the wife’s LCR and my Gunsite Scout, I bought an SR40c in black. Much less recoil than the CZ, super reliable, great handling, great trigger. This gun should shore up my handgun needs. I was surprised that the recoil on this firearm was much less than on the Glock 27. Much easier on my 65 year old hands. I love the pistol. It is accurate and comfortable. I had carried the Glock 23 for years but didn’t like the lack of safety. I bought a new stainless Ruger SR40c for $327 out the door. I took it to the range and ran a couple of magazines through it. I must say, much to my surprise, I like the SR40c MUCH BETTER that the Glock 23. It just feels better in my hand and the recoil is much lighter! I am VERY HAPPY with this pistol! I was going to get an SR9C which I had found the best small CC gun after looking at about 10 common small guns. I wanted a caliber of at least 9 mm. I prefer .40 S&W for defense but was willing to slip that to 9 mm for the small size. But when I went into the LGS where the Rugers were on sale, I found both the SR9C and the SR40C were both $378 on sale, I decided to get the 40. I was a little worried about the recoil but I had been impressed by the SR9C and figured I could overcome any recoil problem with practice (which is mainly what we buy guns to do). I traded in a .22 to get the SR40C. My other gun at the time was an S&W M&P 40 full size. I had shot that gun fairly often over 18 months. I found the SR40C no tougher to control than the M&P though it was smaller and lighter. It fit my hand better. I alternated 10 shots with each gun. After a little while, I didn’t know which I was shooting. They were equally accurate. The trigger difference I had also worried about was no longer noticed. Many years ago I learned to shoot with careful aiming using the Weaver method. Now I am learning to shoot in a more practical combat style – acquire the target, put the sharp front sight on the target, get the rear sight in line and go boom. My target is a white 11×10 page. I aim for the center of the page and shoot. I put marks on the page for scoring though I cannot see them when aiming. They are for scoring. The first day my scores were close to the M&P scores. a week later the Ruger beat the M&P on several targets. My Ruger is comfortable and fun to shoot. I never thought I’d say that about a small defense gun. I bought the SR40c several months ago and performed flawlessly for several hundred rounds. I started getting light strikes consistently 6 out of 50 rounds which made me question it’s reliability. I found Galloway Precision website that seemed to know every issue SR pistols have ever had. I decided to buy a slightly stronger striker spring from them along with a trigger kit, polished indicators and ghost reset bar. I didn’t want to ship the gun off to Ruger for diagnosis and repair so i’m going to try these upgrades. I’ll post results after I get a chance to try it out. I installed the upgrades from Galloway Precision today and cannot believe the difference. I liked the trigger before, but I was just concerned with the light strikes. I wondered how much a heavier striker spring would affect the trigger pull, so I installed the striker spring first and tested it. I really couldn’t tell a noticeable difference in trigger pull. So then I installed the trigger kit with the polished stainless steel indicator, and Ghost reset bar. I retested and could definitly tell the difference in lighter and faster trigger pull and reset speed. The high visibility of the indicator is a very nice improvement too. The bottom line is that this upgrade made a good gun into a great gun, and a good trigger into a freaking awesome trigger. Highly recommended upgrade.